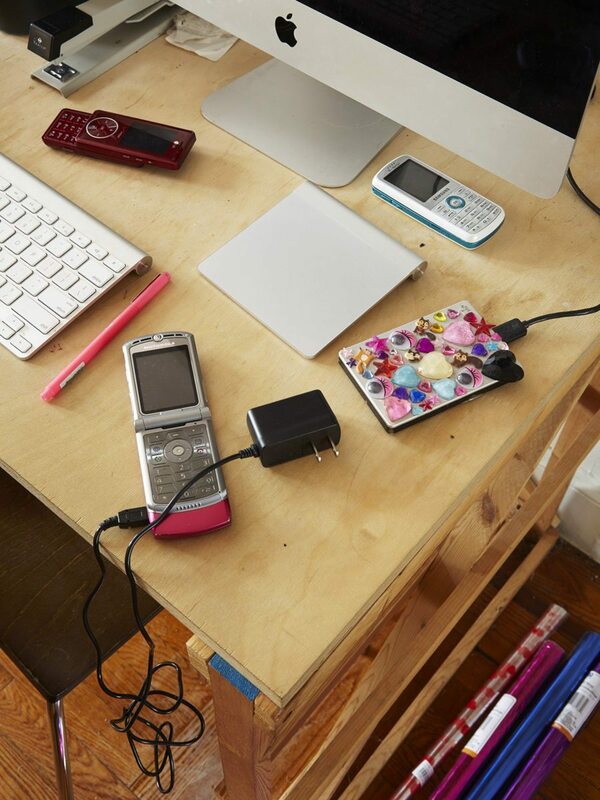 What do you like about your working space and how it’s set up? You work from your bedroom mostly—and that setting is a major part of your work too, much more so than the average artist. How important is the studio/bedroom to your work and understanding it? It stems from financial limitations—I couldn’t and honestly still can’t afford a separate studio space. These initial monetary restrictions have definitely had an effect on the way that I produce my work. If money weren’t an issue, I wonder which areas I would have explored starting out—maybe I’d be making huge prints or something, who knows. My work is a product of my environment and in turn shapes my surroundings. I treat my bedroom like a movie set because of it. Everything has the potential to be filmed, everything is a costume. Can you describe where you work to me and what your average day is like? Since we last chatted, you’ve relocated to NY from Detroit. I wish I had some sweet little rituals I programmed into each day that I could share with you. My days are pretty scattered, I’m working on so many things the structure of my day changes drastically. Usually, though, I’m staring at my computer and taking breaks to watch YouTube videos or schedule time to “surf the web” since people don’t do that anymore—they just scroll through feeds. I’d say my day to day life is pretty similar to how it was being in Detroit in terms of getting work done. I will say, however, that being in New York I see fewer people (friends) on a regular basis. In Detroit, I had a lot of roommates and a lot of my friends lived in my neighborhood and would just pop by to hang out on my porch or come over for dinner. You get a lot less of that here, so it can get lonely. I’ve been making balloons! I just started printing comments (YouTube specifically) on balloons for a group show in New York next month. I’d like to eventually do more—this is sort of just a trial run. A lot of the stuff ends up building upon itself. I’m also still working on exploring the contents of my teenage years (back when I was Amalia) on the Internet and am extracting things from my old LiveJournal and Xanga accounts. I’ve taken a specific interest in MySpace so I’m trying to find a way to make interesting work or reimagine some sort of archive around it since all of old MySpace was essentially purged. Maybe it’s just something about getting older, but watching the Internet rot and websites turn into graveyards is really pushing me to try and do as much as I can to save things and if I can’t save them find ways to rebuild or reimagine them. I see a lot of work being done for GeoCities and even current day web archival but it feels like 2003 to 2009 is just rapidly disappearing and no one cares because they still find those parts of themselves embarrassing maybe? I don’t know. There’s definitely something about time. Do we need to have that distance to be able to laugh? There’s definitely a window of time between something becoming funny/nostalgic and something being straight up embarrassing. It’s really interesting to me you’re thinking about salvaging and archiving now, because I hear a lot about how the “current generation” isn’t going to have all those physical records of memories, like letters. I spent the afternoon yesterday at my aunt’s house reading family letters from the 1970s. It’s kind of freaky that I’ll never have a box of old letters or photos to sift through. I’ll just have hard drives—and who knows how “compatible” or reliable any of those things will be in the next five years even. I wonder what Instagram will be in the next five years. Imagine sitting down and looking through someone’s Instagram in fifty years, that’s just not going to happen. These are such important parts of ourselves and our heritage, our understanding of our place in the world. Is there a good way to archive all that digital stuff to be able to look at it? Can you imagine sharing that in the future? I’m still trying to figure out the best ways to keep everything stored. Right now I’m living in a sort of organized chaos and trying to catch up after years of neglect. I had a computer hard drive crash that stored all of my information from 2007 to 2010. The only file information I have from those years are the things I bothered to post online, so my memory of me is just as good as anyone else’s. A lot of it is reinterpreting or reimagining my past. Physically speaking, most shows I do are small attempts to chip away at the archive. What do you like to do in NY? Any discoveries? Parks, public space in NY is so cherished and special, it’s beautiful how people hang out in parks here. It’s also free! I honestly feel like I spend $20 an hour just leaving the house in New York so it’s important for me to find things that don’t involve spending money. I’ve also taken an interest in the history of neighbourhoods—particularly in Brooklyn—so I’m always staring at buildings and trying to find out more about where I am/what I’m walking past. I just recently did an architectural/historical walking tour which is so out of left field for me. I’m not sure any of that will find its way into my art but not everything has to. That sounds fun, looking at the city around you with fresh eyes. Especially somewhere like New York that everyone feels they know somehow… Do you still think about London sometimes too? Would you ever live here? Everyone in New York knows something, that’s for sure. It’s amazing how everyone can have a completely different relationship to the same block. If it were more feasible for me to move to London I would do it. Slide to Expose recently won the Lumen Prize Founder’s Prize. Can you tell me more about that project, I know it deals with a lot of issues you’ve returned to in your individual work, like privacy and intimacy. Slide To Expose was a collaborative augmented reality project/installation between myself, Nicole Ruggiero and Refrakt. It set out to mirror the way we interact with our devices and highlights how we’re never truly alone, even when we’re in a private space. Sort of the idea that we’re all walking around with these complicated and discrete emotions that are basically triggered by our devices. 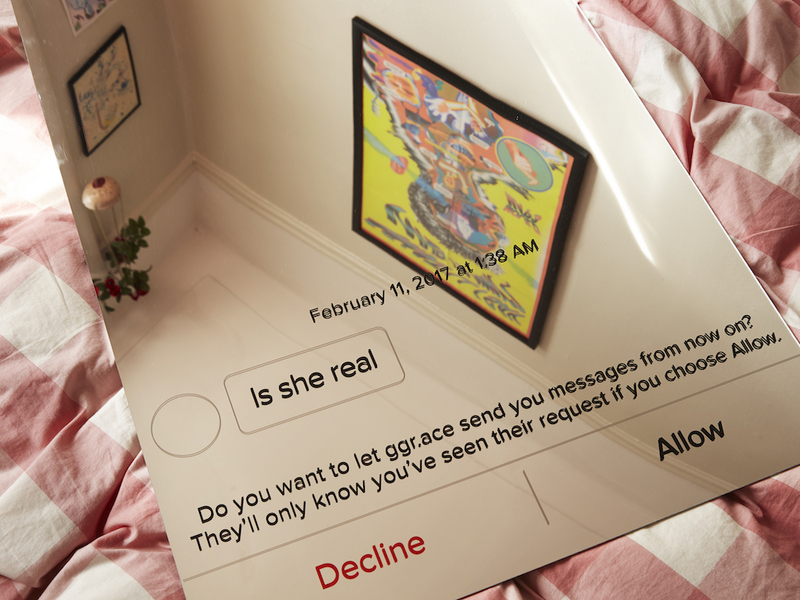 We added AR to “expose” the hidden lives of our phones and our inner monologues. How was it to win, and what will come out of that? I’ve never won a prize before! It was amazing because we set out to do this project, all of us not really knowing each other but respecting one another’s work and never really had a goal for it, so it’s cool that now it’s being toured all around the world. It’ll be on display in Beijing in November; I know Lumen is bringing it to multiple cities this year. Congratulations! That will be fascinating to see how it’s received in China given their relationship with social media. Very true, I hadn’t thought about that! 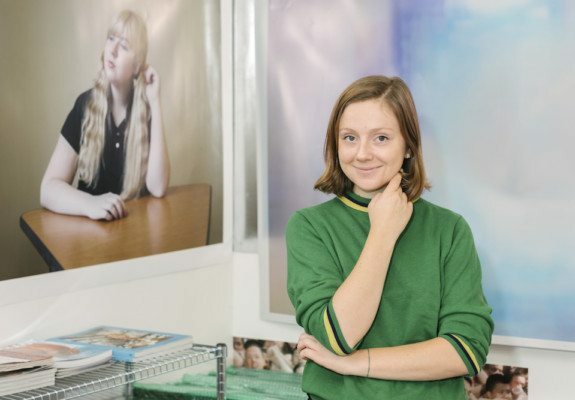 Actually, you’re one of the few artists working online, with your own image and with social media and self-image, to have broken through to the art world. At least, that’s how it seems. I know in the past you said that kind of academic acceptance wasn’t necessarily something you aimed for, but how do you feel about it? Do you feel the reception is changing? I’ve definitely seen my audience change and grow larger as my “career” has progressed. This seems natural to me, but I still feel like I come from a pretty DIY background; someone once called it “digital DIY” which is the perfect term for it. I went into art making being obsessed with the Internet and just exploring. It’s amazing that professors want me to come and talk to their students or that people want to write papers about me. It’s also interesting how the people that “understand” or are even most excited about what I’m doing are not necessarily academic types anyway. That’s the beautiful thing about how you work and how people view it and can interact with it. You’ve also spoken quite a lot on social media about dealing with shame. It’s something I really identify with. Does making work help? Making work helps—maybe because I make so much of it that I’m constantly dumping. I think if I were tweaking every little thing instead of just constantly purging, collecting, curating and re-purging I’d be too in my head. It’s good to be in your head but the audience participation and the feedback loop keeps me going. Is it as important to you to speak out about those things? And how much do you think about your community when you make your work? Does that support system ever also become a burden for creating, in a way? The Internet has changed a lot in the past fifteen years (when I really started using it). I don’t think people trust each other as much as they used to. It makes it harder for me to open up. I feel like I’ve closed up a lot even over the past year—or maybe I’ve just distanced myself from my work. I used to feel a lot of pressure to comment or share or make work at a certain speed but I don’t anymore. It’s emotionally exhausting putting yourself out there on a daily basis and having that be tied into the way you make money and also, in a lot of ways, your personal relationships. Kind of like how my bed and my studio are in the same room, it gets blurry and sometimes you feel kind of sick. But I keep going. I just have to take certain emotional precautions and steps in order to feel good. Sounds like good advice. Any plans to come back to London soon? You did some great shows in Hackney. Hooray! I can’t wait to see it—and you!